Over the past two years, Stillwater Associates has offered a series of articles on various aspects of IMO 2020. Implementation of IMO 2020 is now less than ten months away. In this article, we will provide information on data sources providing visibility to spot and futures prices for IMO 2020-compliant blends of Very Low Sulfur Fuel Oil (VLSFO). Additionally, we provide an update on how futures prices for a surrogate of VLSFO have evolved over the past 12 months along with other key commodities that are part of the IMO 2020 assessment landscape. The International Maritime Organization (IMO) is a specialized agency of the United Nations. Through regulations approved by its signatory member countries, IMO is responsible for establishing maritime safety and environmental regulations for the world’s open oceans. Based on amendments to its MARPOL VI regulations that were approved in 2008, IMO has made reductions in the maximum allowable sulfur content of marine fuel (historically referred to as “bunker fuel oil”) consumed by marine vessels in several steps over the past decade. IMO will implement the final step of its marine fuel sulfur reduction program on January 1, 2020 (hence the term “IMO 2020”). IMO 2020 will reduce the maximum sulfur content of marine fuel consumed on open oceans from 3.5% to 0.5% (by weight) globally on January 1, 2020. Vessels that have installed and operate stack gas scrubbing systems will be exempted from this rule and allowed to continue utilizing 3.5% sulfur marine fuel. This final step will also have the most significant market impact of this series of sulfur content reductions because of the magnitude of the reduction and because it will be both global and instantaneous. Implementation of IMO 2020 will impact prices markedly for crude oil and refined products – well beyond just marine fuel – beginning in the second half of 2019. Both absolute prices and key price differentials will be impacted. The magnitude and duration of these price changes, though, are still unknowns. The difficulty in the near-term for both spot and futures prices reporting is the lack of liquidity. As transaction volumes increase, these prices will offer a stronger indicator on where the market is and where it is heading on both an absolute and relative pricing basis. 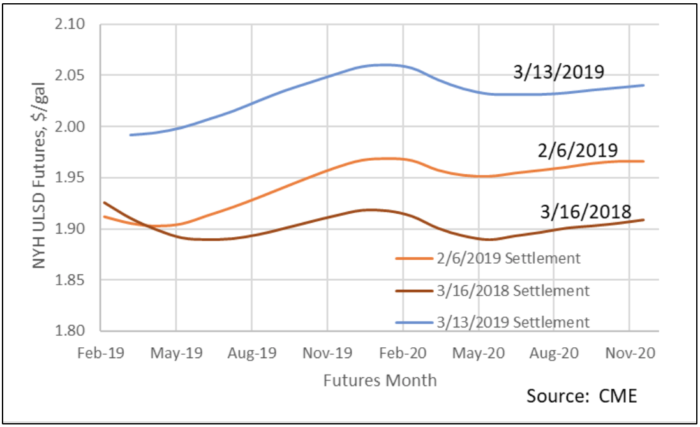 Thus far, sales volume and open interest for these contracts have been very light. 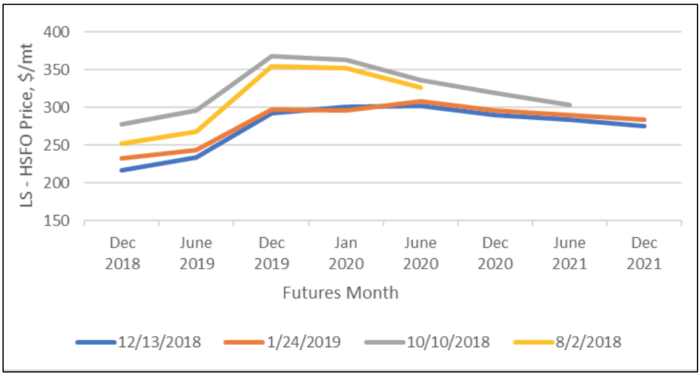 Due to this lack of liquidity, these futures contracts do not currently paint a solid picture of the VLSFO marketplace post- rollout of IMO 2020. Argus began reporting prices for IMO 2020-compliant marine fuel (“0.5% sulphur fuel oil”) in Singapore in October 2018. Initially, the prices reported were for seven-to-one blends of marine gasoil (0.1% sulfur) and 380 cSt High Sulfur Fuel Oil (HSFO). Argus followed in November 2018 with its introduction of formula-calculated prices for IMO 2020-compliant marine fuels in Rotterdam, New York Harbor, and the U.S. Gulf Coast. Argus ceased utilizing the seven-to-one blend ratio calculated valuation mechanism for Singapore 0.5% sulfur fuel oil in February 2019 and is now basing its assessments on price information heard in the market. These are “talked” prices in the absence of actual transaction prices. As liquidity improves, Argus has indicated it will shift to volume-weighted averaging of transaction prices in its market assessment process. Platts began reporting on IMO 2020-compliant marine fuels (“Marine Fuel 0.5%”) in Singapore, Rotterdam, Fujairah, and Houston on January 2, 2019. The first transaction for FOB Singapore Marine Fuel 0.5% was reported for January 2, 2019. Market liquidity is not yet good so far ahead of IMO 2020 rollout. OPIS began reporting prices for Very Low Sulfur Bulk Fuel Oil (“0.5% VLSFO”) in Singapore, Rotterdam, New York Harbor, and Houston in early 2019. Like Argus, until liquidity of actual transactions improves, OPIS will report calculated rather than actual prices for VLSFO blends. 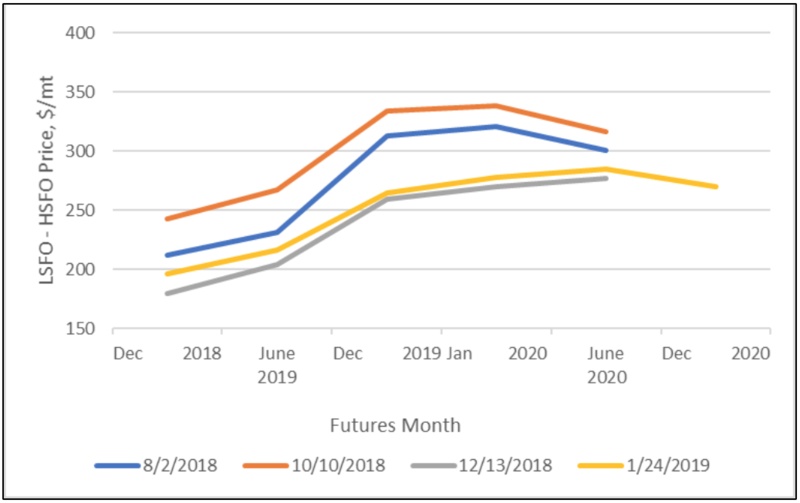 In this section, we review trends in the futures markets to help explain how the market is pricing products with the upcoming spec changes in 2020. 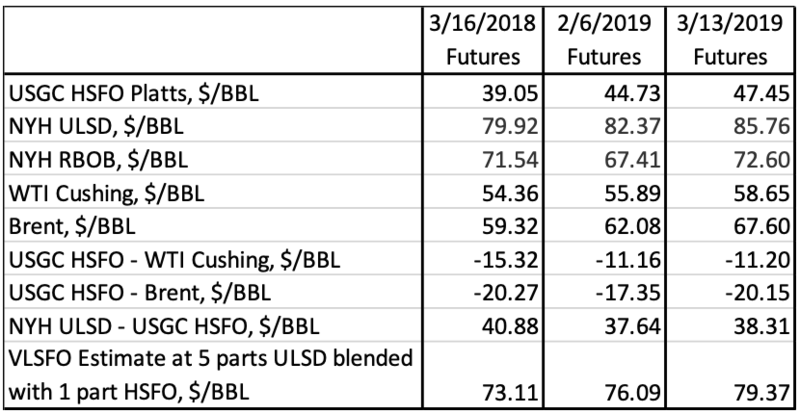 The key futures prices available for this analysis are for ULSD and HSFO. We also review changes in crude prices since they impact all products and show gasoline prices for reference since many gas oils which can be used in VLSFO blending are priced off of both gasoline and diesel. 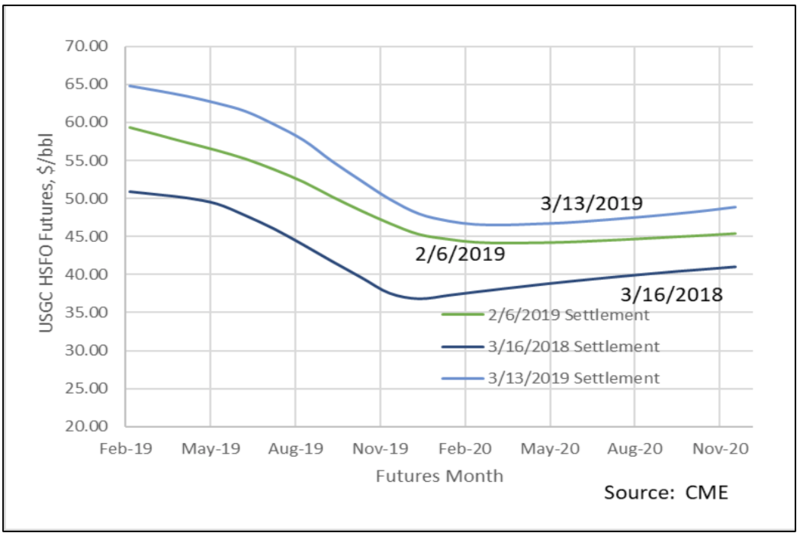 First, let’s look at how futures price differentials between ULSD and HSFO have changed over the past ten months or so in different markets around the world. The first three figures below show the changes in futures differentials between diesel and HSFO for U.S., Northwest Europe (NWE) and Singapore markets, respectively. (Gasoil in NWE and Singapore is very similar to ULSD.) 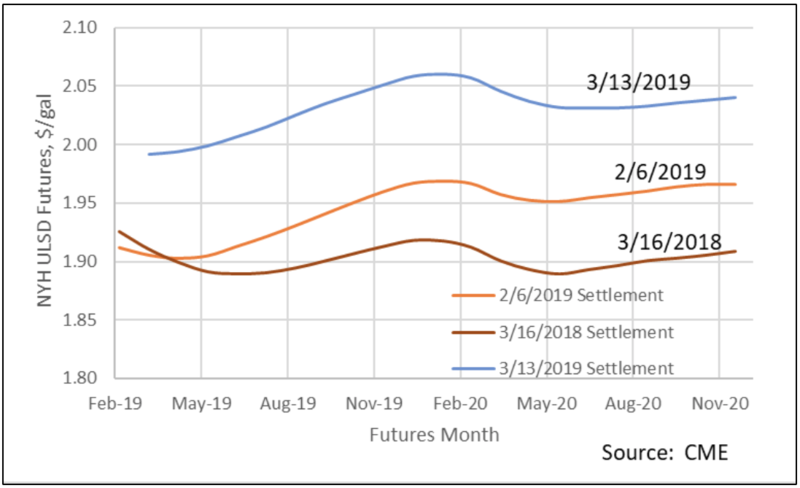 All three markets show significant movement downward in prompt as well as 2020 futures differentials between early and late 2018. In NWE and Singapore, the differentials drop by about $60/MT (or $10/bbl) to $300 ($48/bbl) and $280 per MT ($44/bbl), respectively. In the US, the differential dropped about $5/bbl to around $38 per barrel. We attribute these directional changes to market participants’ analyses discovering a variety of ways to optimize refining capacity to deal with an excess of high sulfur vacuum resid. Also, notice that in all cases the differentials are much higher than today. 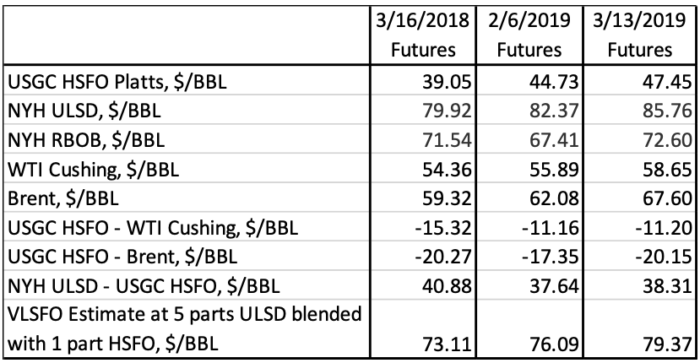 In the most recent US futures, the price difference increases from $30 to $43 per barrel. These changes seem reasonable based on all of the technical studies we reviewed that mostly reflected the sentiments held earlier in 2018. In Europe, we also have access to LSFO futures. The LSFO to HSFO differentials are plotted in Figure 4 below. 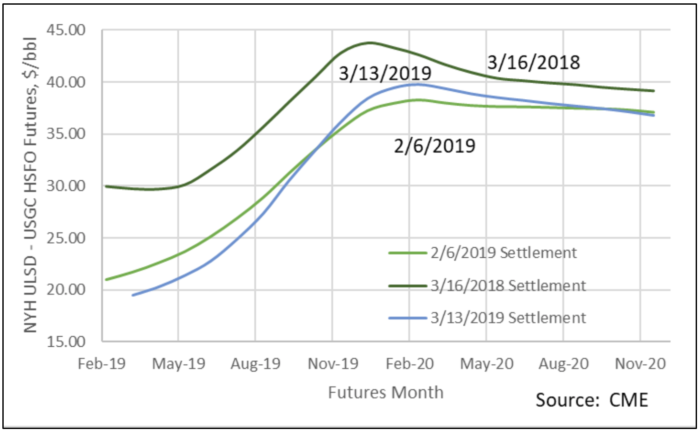 Here we see that unlike the ULSD curves, these differentials increased significantly over the last three months of 2018, from $20 to $100/MT in the prompt months and from $100 to $170/MT or so in 2020. This means that LSFO is expected to price much closer to ULSD than it has in the past, suggesting that the pricing mechanism of heavy oils moving forward is likely to be a much stronger function of sulfur content than it has in the past. 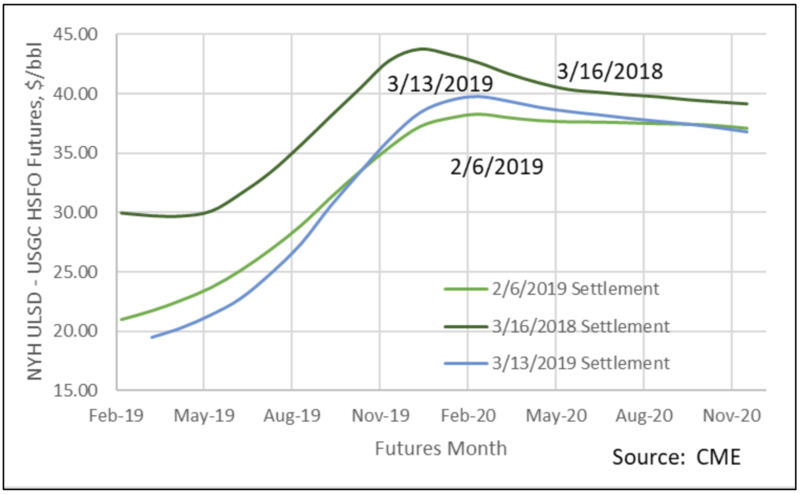 In Figures 5 and 6 below we plot U.S. Gulf Coast HSFO and New York Harbor ULSD futures prices on three specific dates that span a year. Both curves have risen while the difference between them has declined (as shown in Figure 1), but diesel has strengthened significantly in the last month. 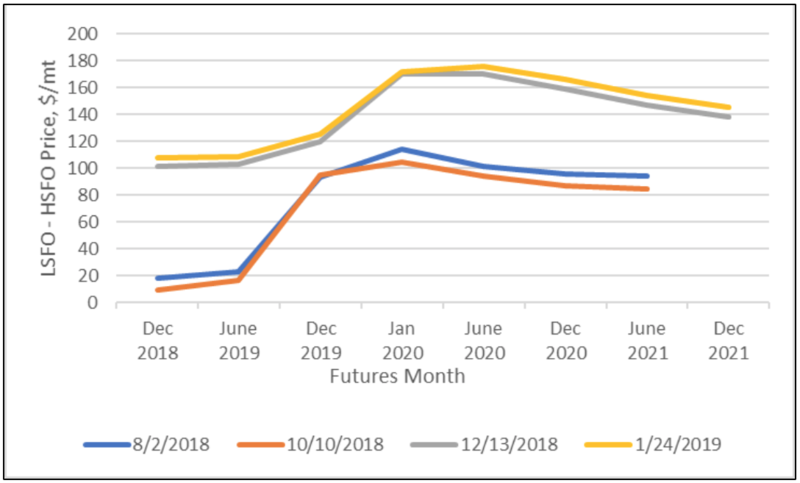 Gasoline futures prices are depicted in Figure 7 below. 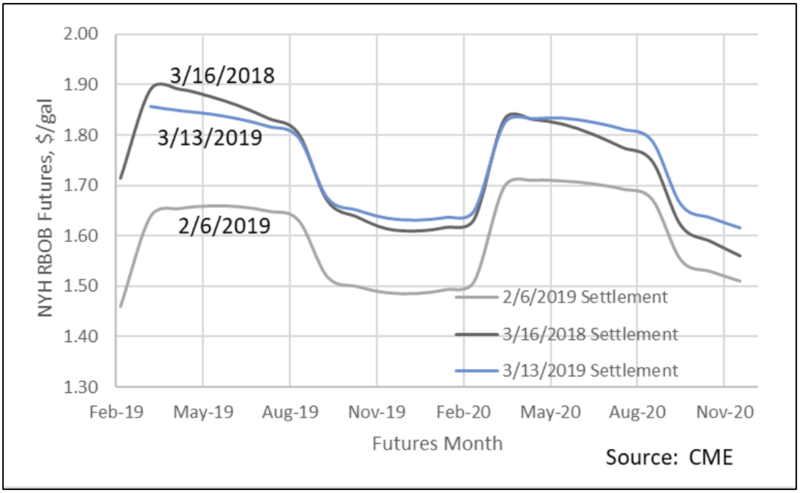 RBOB prices follow seasonal changes in Reid Vapor Pressure (RVP) specifications, and they decreased due to a market excess this past winter but have recovered in the past month and now show prices in 2020 that are very similar to those shown in 2019. Contrast this with the trend for diesel in Figure 6 that shows strengthening ULSD prices in 2020. Even though futures and spot prices for VLSFO have yet not been established, some market participants have suggested creating a synthetic price market that is a blend of ULSD and HSFO. This makes sense because much of the IMO 2020-compliant marine fuels used in 2020 is likely to be VLSFO marine fuel blends that are primarily distillate. Most observers expect that VLSFO will trade much closer to ULSD prices than to HSFO prices, which also makes sense because the average sulfur content of HSFO worldwide was 2.60% in 2017 according to the International Bunker Industry Association (IBIA). A simple sulfur balance suggests that blends between 80 and 85 percent ULSD will meet the 0.5% specification, and the most common proxy for VLSFO price in the future is five parts ULSD price and one part HSFO. Table 1 below summarizes the futures data plotted in Figures 1 and 5-7. This table includes a calculated estimate of VLSFO price using the five-to-one proxy in the bottom line. Overall, both HSFO price and the proxy for VLSFO have increased in the past year along with crude oil, but the HSFO price has increased a bit more. It appears that market participants have done analyses to conclude that there are enough ways to dispose of high sulfur refinery residual fuels by filling excess coker capacity, cutpoint changes, and remaining HSFO demand as bunker fuel to avoid competing with cheaper coal as power plant feed in North America. Recent increases in global HSFO prices have also been attributed to Saudi Arabia choosing to switch from burning crude oil to HSFO in its power plants. IMO 2020 is likely to be the most impactful refined product specification change ever, largely because the change will be both global and instantaneous. Marketplace valuation of VLSFO blends of IMO 2020-compliant fuel should gain significant liquidity over the next six months. In the absence of solid VLSFO prices, the past year has shown significant movement in key price differentials. The rollout of IMO 2020 is quite likely going to be a bumpy ride from a key price differentials perspective. Stillwater Associates stands ready to partner with you to better understand IMO 2020, explore options, and help in identifying the most beneficial strategy and tactics for your situation. Contact us to see how we can add value to your business.